We have collected these useful links together for reference purposes, so if you are wondering how we know the number of people who visit Florida in 2011 or what the population of Orlando is, the following list of references and sources should tell you. Please note that we cannot be responsible for the accuracy or use of any information on an external website. Case-Shiller index data is considered highly useful but economists and is used by use for historial land pricing. You can download the latest spreadsheet figures from the Yale website here. 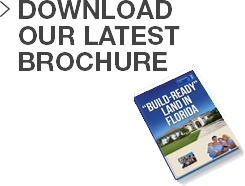 The Lincoln Institute of Land Policy provides some excellent statistics on Land Pricing in Florida (and other States). You can download their data from here. If you would like more information on the facts and figures on this website, please get in contact.